New & improved Xactics™ horse feeder made of first quality polyethylene resin treated against UV rays. Can feed up to 8 horses at the same time, will reduce bullish behavior and create less stress at meal time. All 8 openings are well rounded and soft in order to prevent the brake of the mane. 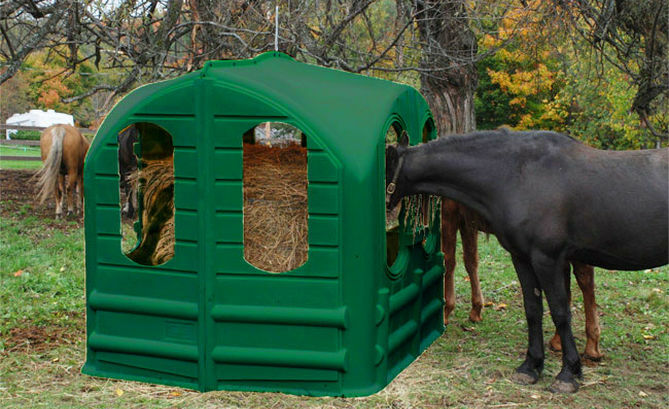 Once assembled, the Xactics™ horse feeder can accept up to 20 small square bales or 1 large round bale. Easy to assemble and to handle. You will save up 30% on hay feed expenditure and up to 50 % on your handling time. Let your horses enjoy! Nominal dimensions: 84’’ X 72’’ X 72’’. Weight: Approximately 100 Kg. Place the two halves back to back standing up and bolt the 2 corners at the top as well as the 2 places inside the feeder. These can be reached through the windows. Put the feeder down sideways and bolt all the remaining holes inside and on top of the feeder. Put it upwards and let your horse enjoy!